Day 1: (-/L/-) Pick you up from hotel in Hoi An and we start phong nha tour from hoi an. We directly transfer you to Phong Nha National Park in Quang Binh province. It is approximately 7 hrs drive from Hoi An and we will take Hai Van pass along the way. The pass is known as “one of the most imposing passes in Vietnam” with many snaking winding mountain roads. We make some stops along the way for you to admire the beauty of the pass. On the top road are some war relics for you to think about Vietnam war such as brick towers and concrete bunkers. We will continue to a place called “Lang Co” beach town where you have amazing view of the area. The white sandy beach stretching along the coast is really good spot for some pictures. We are moving on the tour by driving through lakes, lagoons, rice fields and villages of Hue. You will feel how green the country is. Next, we reach Hien Luong bridge that divided the country in almost twenty years and then Ben Hai river that witnessed the hardship, the bravery of the local people in Vietnam war to protect the area. Although the area was heavily damaged by the war but some relics are still standing like the reminders of the past. You might walk around and take some pictures then we are heading to local restaurant for short break. Then we continue the tour to Phong Nha National Park where the hotel is located. On arrival, we do hotel check in and you can have a rest. Day 2: (-/L/-) We start off the day by a short drive to Phong Nha cave. The landscape in Phong Nha is spectacular with lots of lime stone mountains in different shapes. On arrival, we embark on small motorized boat and sail along the Son river – beautiful emerald water with peaceful rural scenery. The guide will tell you the daily life of the people here. Reaching the cave entrance, the engine is off and we start exploring the cave. 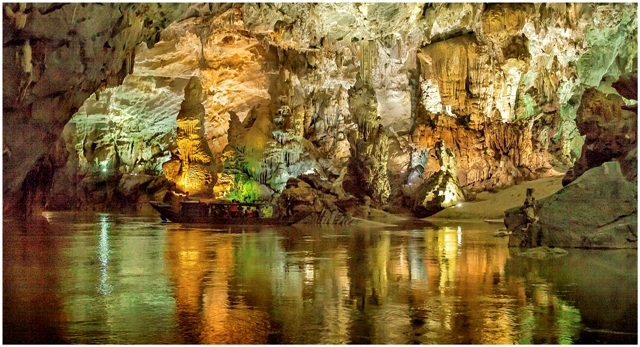 Phong Nha cave famous for its longest underground river and the scenery inside the cave is so fantastic. All stalagmites and stalactites appear wherever you go in and such as a different world you only see in a movie. The pictures of cactus, lady Buddha, tiger, unicorn will make you feel you are being lost in fairy tale. After getting out of Phong Nha cave, we can have a short break then we climb up lots of stairs to visit Tien Son cave. It is known as “the first wonder” and it lies roughly 250m high from Phong Nha cave. The rock formations in Tien Son cave happened dating back millions years ago and created another paradise in the cave. Stalagmites and stalactites here with all colors and it is like you enter a nothingness. The small paths in the cave lead you through edges of stalactites and sometimes you have to bend down to go through. After exploring it, we go back down and we sail back to the parking lot. From here, we take you to a local restaurant for lunch and then transfer you back to the hotel and phong nha tour from hoi an will finish here. What do you expect with phong nha tour from hoi an? Although the drive from hoi an to phong nha is pretty long but the trip is worth it. 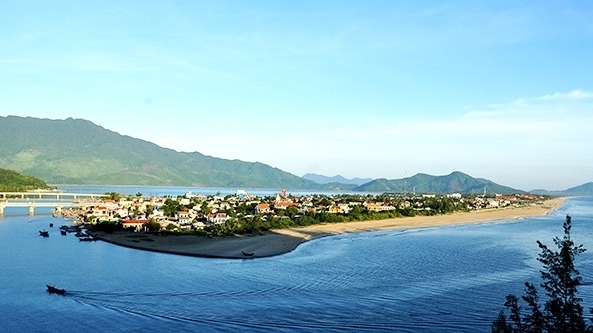 On the way, we make many stops for photographs such as Hai Van pass, Lang Co beach, Lap An lagoon. Especially, we pass by DMZ (Demilitarized Zone), a historic spot in Vietnam war and visitors know more about the war. Some of war relics such as Ben Hai river, Hien Luong bridge will remind visitors of ever bloody battles that happened around DMZ in 1960′. Notes: the tour is conducted in a nice, pleasant or sunny day. In case of bad weather such as storms or floods, we will not organize the tour for customers’ safety.